This one day conference was devoted to a neglected area of theatre history and in particular with reference to the companies devoted to touring opera. Writers on this topic and those with expertise in the Carl Rosa and Pyne Harrison companies in Britain and the Boston Ideal company in America were represented. A warm Academy welcome was given by Deputy Principal, Dr Timothy Jones. The Academy has a wealth of memorabilia to do with famous British composers, conductors and singers and during the event Royal Academy Archivist, Janet Snowman, gave tours of the Academy’s rich collection of memorabilia to provide some relevant and fascinating background. The excellent programme was put together and run by Steven Martin who spoke at length on the now forgotten British National Opera These sketchy beginnings had been cemented by Lord Reith (of the BBC) who recognised the cultural and educational merits of opera broadcasting. Its success soaked up such a large proportion of licence payers’ funds that the government had to be approached to provide a firmer financial footing. This was the start of the Arts Council in Great Britain. The delegates were appreciative of the important contribution to opera provided by John Barbirolli in his connection with the British National Opera Company. This talk was given by Raymond Holden. Barbirolli had been initially tutored on the violin and later developed notable expertise on the ‘cello, playing in the Covent Garden, and later the Beecham orchestra. An early admirer of Puccini he later boasted that he was the only conductor (of his period) to have conducted opera at Covent Garden in four languages. A dynamic musician Barbirolli always knew what he wanted out of a piece and demonstrated ‘perfect responsiveness’ from the players of his orchestras. 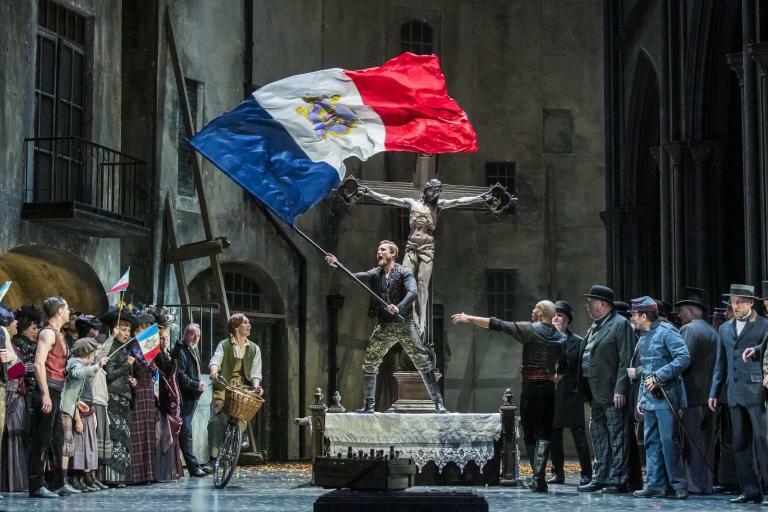 The workings of the most famous British opera touring company, the Carl Rosa Opera Company, was addressed by John Ward, Librarian and Trustee of the Carl Rosa Trust. We were given a clear picture of how impresario Rosa both formed and ran his company, and we gained insight to the way they toured. It was interesting to discover from most of the speakers that such companies toured the provinces widely, yet London theatre managers excluded them from the West End. London opera was expected to be sung in Italian whereas the touring companies performed the well known works in the vernacular. They reached everyday people with music that was otherwise kept for the more affluent patrons. It was amazing to be shown the artwork for one of the Carl Rosa sets, complete with a highly complex plan drawing of how the London staging was achieved with rostra and cut-outs to provide a realistic perspective to the setting. Their touring would naturally have slimmed down sets in their need to cover many out-of-the-way places like Carlyle, Southport, Accrington, Hastings and Brighton on their touring circuit. Equally fascinating was to know the frequency with which certain operas were performed in the decades of the late 19th Century. This area was expanded by Paul Rodmell who talked about bringing opera to the people. he mentioned the importance of the Moody Manners Opera Company which toured late in the 19th Century until it disbanded during the First World War. The Turner Opera Company was ambitious in its repertoire which started in 1886. Faust, Satanella and Bride of Lammermoor were staged but the orchestra was on occasions reduced to a cornet, two violins and a harmonium! The work of these companies and others have been the subject of fresh research the speaker has embedded himself in with the result of a new publication on the subject. Professor Katherine Preston in her keynote address gave the American perspective of the Boston and New York company touring circuits which got as far south as New Orleans. There were a number of American singers associated with these companies who crossed the Atlantic to appear on the London stage. Emily Soldene and Geraldine Ulmar were two recognisable names from West End programmes. The speaker’s fast flowing address covered a lot of ground. Today’s English Touring Opera has descended from this historical background of touring companies and John Holmes explained some of the difficulties they are nowadays confronted with. They are conducting research into audiences’ opinions of cinema relays and whether this might displace the theatre-going public. One thinks not. I noticed that discussion on this topic might have overlooked asking about the feeling of ‘presence’ that is missing with video recordings. Good organisation is paramount and this seems to have been a common denominator since the beginnings. The Royal Academy generously hosted a wine reception to allow healthy cross-fertilisation of opinion and thinking. The new Carl Rosa Opera company told me that they are coming to life next year with two fresh productions, so this tradition lives on.